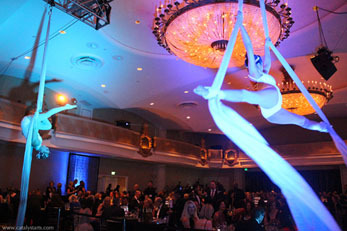 We adore bringing our magic to Galas. 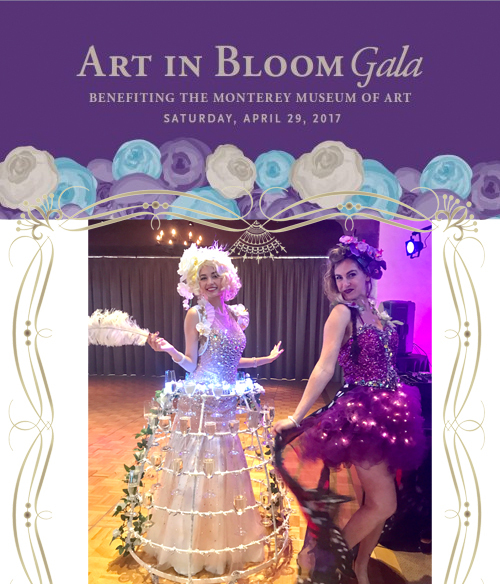 They are grand, elegant, and almost always raising money for a good cause. 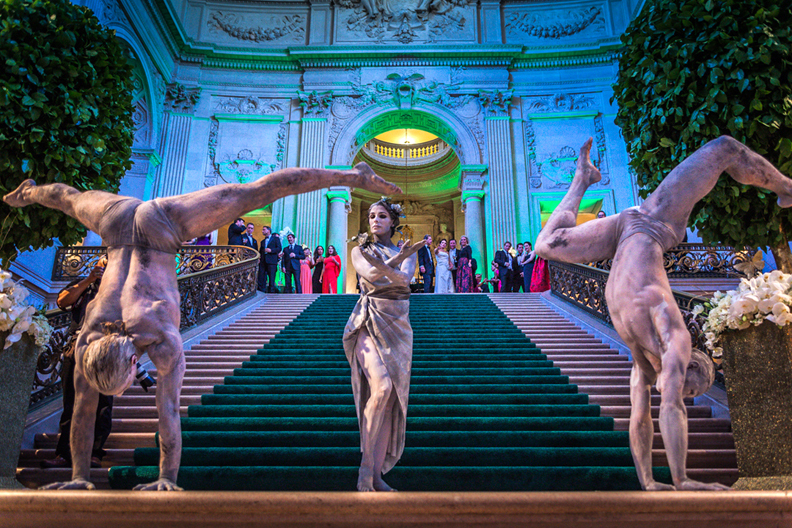 Catalyst Arts worked under celebrity event planner Colin Cowie & Todd Events To bring unique entertainment to the SF Opera’s opening night gala at City Hall. 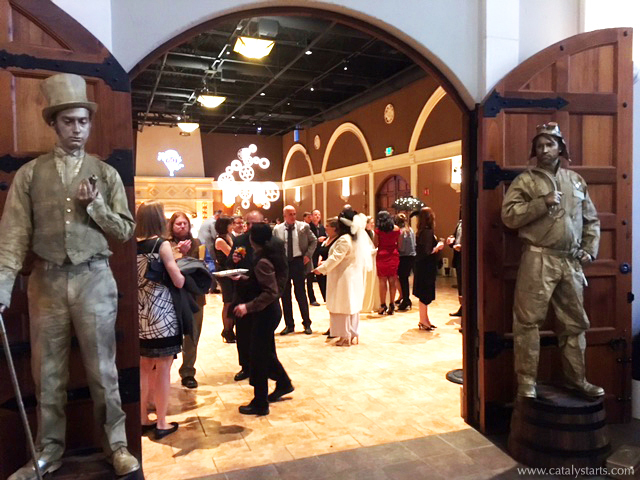 We costumed and body painted and booked 10 entertainers including 4 living statues, 3 stilt walkers, & 3 fire dancers to animate the ‘Garden of good & evil’ theme. 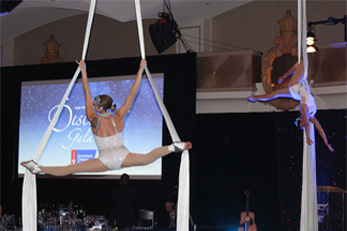 In September 2016 2 of our aerialists flew high above the guests at this stellar Gala for American Cancer Society in San Francisco. After dinner. 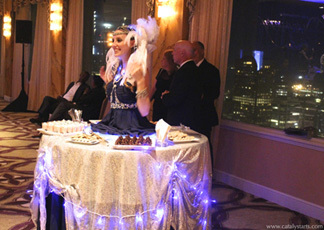 our starry nights themed Living Table was a fanciful Dessert Skirt for the in the Crown Room at the Fairmont for dancing & dessert. 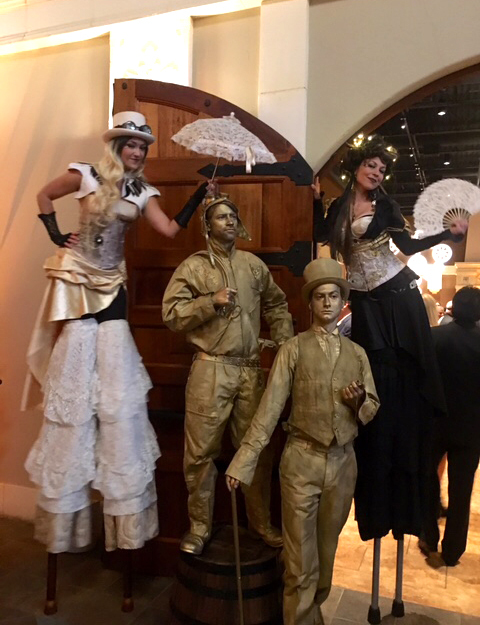 We had giant Stilt Ladies greeting, 2 Golden Living Statues (a gentlemen & an airship captain) and a deluxe Champagne Skirt lady offering libations. A Circus themed Gala for the Special Events Industry! We couldn’t resist. 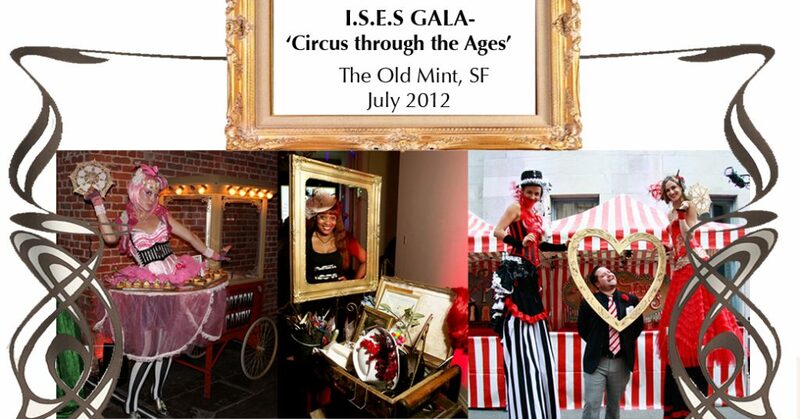 We debuted our ‘Become the Art’ photo opp cart & a dessert serving skirt & 2 stilt walkers. 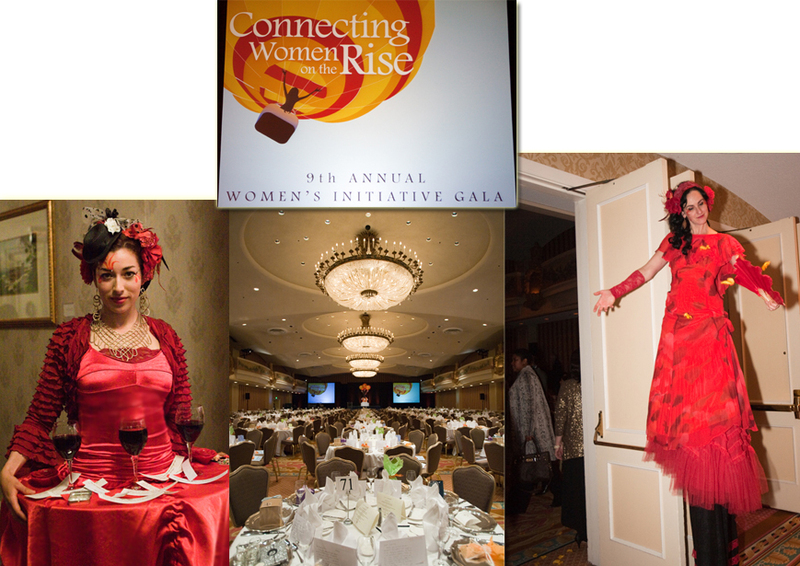 At this fundraising gala for Women’s Initiative in 2011 we debuted our first made serving skirt (which had inspiring quotes and some glasses of wine) as well as had a stilt walker fanning rose petals onto guests as they entered the ballroom. 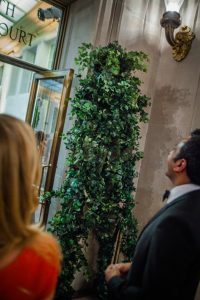 Nice touch to make people feel special! 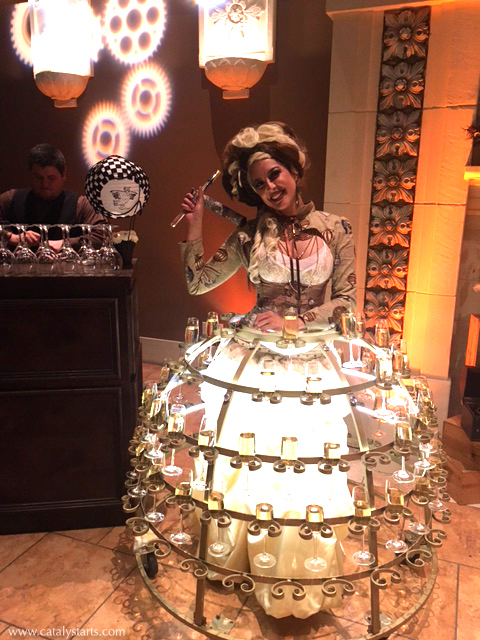 At this Eco Gatsby themed fundraiser at the Bentley Reserve, we had 1 hostess serving champagne with a tasty green liquer, & a green fairy tray lady serving nibbles. 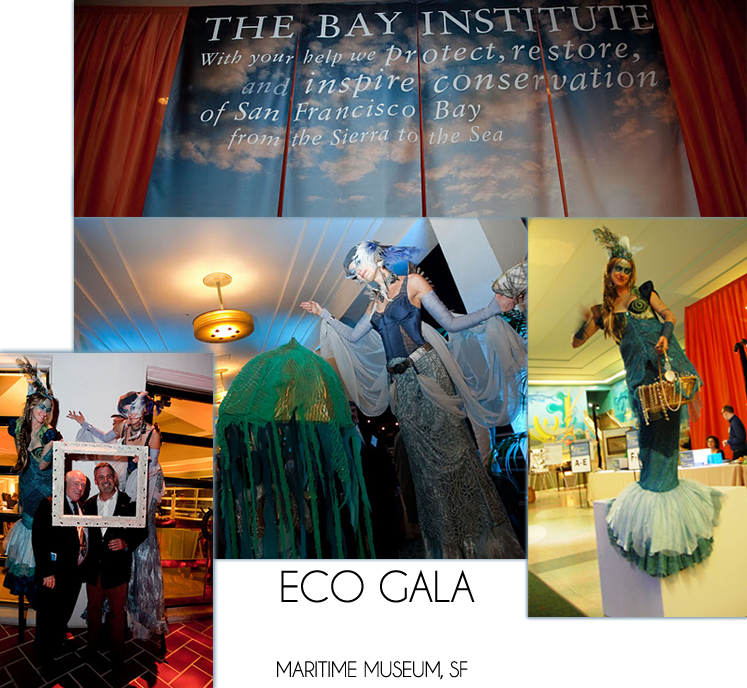 We brought 4 animal/sea themed entertainers to the Bay Institute’s 30th Anniversary Gala.